Big surprise. Many of my friends are also landscape designers. We get together to talk plants, garden design challenges and plant problems while enjoying good food along with a little wine thrown in for good measure. Recently we met in Corralitos to exchange favorite go-to plant ideas and tour the truly fabulous garden of our host. Filled with interesting foliage and texture as well as plants that flower over a long season we all came away excited to use them in our next design. Maybe some of these ideas will work in your own garden. Every interesting garden has good bones. A successful one has a focal point, garden rooms with “walls” and a “ceiling”, plants with different textures and foliage color, repetition and unity. My friend’s garden is no exception. Rivaling for our attention from the breathtaking view of Monterey bay, a fremontodendron, in full bloom, was a real show stopper. This California native shrub requires little irrigation and provided the perfect backdrop to the entry garden. Other plants that brought this garden to life included a stunning Blue Glow agave paired with the burgundy foliage of loropetalum rubrum. Both have low water needs and aren’t attractive to deer. A small recirculating fountain tucked within a pocket garden provided an inviting lure for songbirds. Surrounded by the unique lotus corniculatus or eggs and bacon plant along with a tropical-looking melianthus major aka honey bush this garden room invited one to stick around for awhile. We garden designers were impressed with the size and vigor of acacia ‘Cousin Itt’. This lovely small plant with emerald green, feathery foliage stays small in the garden and has low water needs. Not to be confused with the bully acacia tree seen around here, it’s one of the good guys. Plant in full sun to partial shade. In deer country you can’t go wrong with euphorbia characias wulfenii ‘Bruce’s Dwarf’. It does an excellent job of seeding itself so beware. Grow it where it can self sow and not become a problem child. Very hardy in winter and water sparingly. In spring and summer the flower heads form at the branch tips covering the plant with a chartreuse color. A French hybrid lilac called Pocahontas scented the air as we exchanged our favorite plants that pull a garden together. The winners included hardy geraniums like Biokovo and Karmina and California native heuchera maxima. Canyon Snow Pacific coast iris also got a lot of votes. Groundcover sedum ‘Angelina’ and lime thyme garnered support also. Abelia ’Kaleidescope’ and ‘Confetti’ got the nod from several of us. Also high on the list of favorite plants, the variegated gold and green cistus was used by many because of its low, mounding habit that hugs the ground and provides a bright evergreen accent to a sunny garden. If you were waiting for some rain before planting to control erosion wait no more. That last storm brought plenty of the wet stuff and the next round is hopefully not far off. You’ve gotten a reminder of those areas that need stabilization during the rainy season. Fall is the perfect time to start planning and planting. The nights are cooler, the days shorter and the soil still warm. Everything that a new plant needs to get a good start. Using the right plants on hillsides can help slow, spread runoff and prevent soil erosion. Often they need to adapt to shallow, poor soil and cope with less than ideal conditions all while putting down dense, strong roots. Mulch also protects soil from direct rain impact and slows runoff across bare soils. This is important while new plants are growing in. Covering the steepest slopes with jute netting through which plants may be installed is an added precaution. What plants are good for controlling erosion in our area? When choosing plants to cover a bank for erosion control, assess the conditions of the area you want to plant. Is it in the sun or shade? Is it a naturally moist area or dry? Do you intend to water it or go with our natural cycle of wet in the winter and dry in the summer? Matching the plant to the site conditions will ensure success. California natives are well suited to this job. If the area you need to stabilize is large and mostly shade, consider ribes viburnifolium or Evergreen Currant. Like mahonia repens or Creeping Mahonia it needs no irrigation when established. Another native, the Common or Creeping Snowberry can also hold the soil on steep banks, spreading by underground stems that stabilize the soil. A bank in the sun would contain a different plant palette. Common native shrubs for sun include ceanothus groundcover types such as ‘Centennial’, ‘Anchor Bay’ and maritimus that are not attractive to deer like the larger leaved varieties. Manzanita are also excellent at controlling erosion. Some other good California native shrubs for erosion control are Western redbud, mountain mahogany, Western mock orange, lemonade berry, toyon, bush poppy, matilija poppy. spicebush, pink flowering currant and Western elderberry. 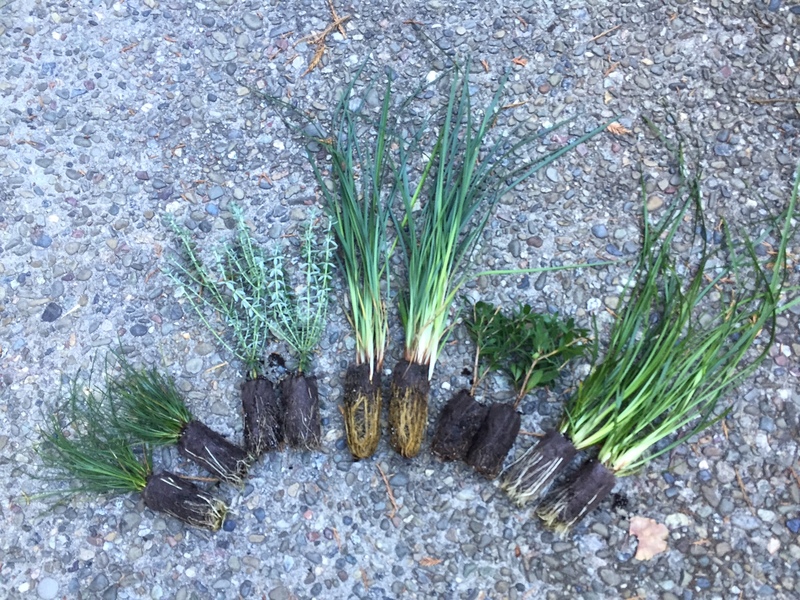 Smaller natives that put down deep roots are yarrow, coast aster, California fuchsia, wild grape, mimulus, buckwheat, wild rose, sage, deer and needle grass, Pacific Coast iris, penstemon, artemisia and salvia. rows. Make an individual terrace for each plant and create a basin or low spot behind each one ( not around the stem ) to catch water. Set the crowns of the plants high so they won’t become saturated and rot after watering and make sure mulch does not build up around the stem. These suggestions are just a few of the plants that control erosion. Every area is different and every situation unique. More and more of us are embracing the concept of gardening with a sense of place. To garden where you live means accepting that your garden in California is naturally more subdued by fall. Plants that bring color to the garden at this time of year are invaluable. A successful garden is a feeling. With Halloween almost upon us orange blooming plants like Lion’s Tail look perfect in the autumn garden and gets the attention of birds, bees and butterflies. The scientific name leonotis leonurus translates from the Greek words meaning lion and ear in reference to the resemblance of the flower to a lion’s ear but this perennial shrub has long been called Lion’s Tail in California. A member of the mint family it starts blooming in very early summer and continues through fall. Having very low water needs and hardy down to 20 degrees it’s perfect for a drought tolerant garden. California fuchsia is also at the height of its blooming season. Starting in the summer and flowering through fall this California native will be covered with orange or scarlet-orange flowers that attract hummingbirds like crazy. A great plant along the path or draping over a rock wall this perennial thrives in areas that might fry other plants. Also known as Epilobium canan or Zauschneria it is in the evening primrose family and native to dry slopes and chaparral especially in California. Another good choice for your drought tolerant garden is the long blooming Hallmark bulbine. The Orange Stalked bulbine is a succulent you’ve got to try. Starting in late spring and continuing through fall and often into winter this one foot tall groundcover spreads to four or five feet wide. The orange star-like flowers with frilly yellow stamens form atop long stalks that rise above the foliage. Remove spent flower stalks to encourage reblooming. What’s a fall garden without an orange or gold hued mimulus to feed the hummingbirds? Mine haven’t stopped blooming since early summer. Deer resistant and drought tolerant Sticky Monkey flower get the sticky part of their common name from their leaves which are covered with a resinous oil discouraging the larvae of the checkerspot butterfly from dining too greedily. Orange and blue are opposite on the color wheel so they look fabulous together. Enter the salvias with their mostly blue and purple flowers. From California natives such as salvia clevelandii to Mexican bush sage to Autumn sage there are thousands of varieties on the market. All are deer resistant, gopher resistant, drought tolerant and hummingbird magnets. Many years ago I was invited by a Scotts Valley resident to visit their garden. This was no ordinary garden I was to learn during my visit and each spring I look forward to seeing what’s new at Doc Hencke’s garden. From his roots in Oklahoma and Texas he describes himself as the “Hillbilly Gardener” but with his extensive knowledge of trees, vines and just about anything that grows he is one of the most successful and enthusiastic horticulturists I know. I wore my walking shoes and we started talking about what changes he’s noted in his landscape the past few years of drought coupled with this winter’s rains. First stop- the straw bale veggie garden. The soil in this part of the garden is blue hard sub soil so this above-ground method of cultivation has been a real success. Richard told me that when the bales were first put in place a couple years ago he watered them thoroughly to start the fermentation process. Using a meat thermometer he determined by the internal temperature when fermentation was complete. He then soaked the bales with liquid organic fertilizer and applied some blood meal to augment nitrogen. The straw bales are decomposing each year but he’s going to use them once more this season. His crop of kale, lettuces and chard looked robust and happy. Nearby a bed of Joe Ghio hybrid bearded iris were in full bloom. “It’s been a great year for iris”, Richard said. Not so good for peach leaf curl. The rains this winter set the perfect stage for the fungus to proliferate. He joked that the birds get the peaches anyway. Richard is redoing his pond this year. He’s tired of fighting the raccoons and algae. Steeper sides will deter the raccoons and deeper water will help to prevent algae growth. He was forced to remove a curly willow that shed leaves into the pond as their natural salicylic acid was poisoning the pond. Last year a new succulent bed was planted along the back of the house and patio. His Sticks on Fire all died over the winter from the cold and rain but the aeonium ’Zwartkop’, echeveria ’Sunburst’, kangaroo paw and various sedums were filling in nicely. Below the patio the golden Mexican marigold and blue Pride of Madeira were in full bloom along with a gorgeous stand of Weeping Leptospermum. “Magnificent this year, just look at this plant. Can you imagine what it’s going to look like in another 15 years?”, he said. Pointing out the visual boundaries he creates with flowering vines growing up into the trees, Richard observed that some are going better than others. Sound familiar in your own garden? Even this expert propagator is sometimes stymied by Mother Nature. I love to hear Doc Hencke’s stories as he shows me around. Stopping at a China Doll houseplant that has now grown into a tree he tells me he thinks it’s one of the tallest specimens ever. His giant bird of paradise flower pod opened last week. I’d never seen their enormous blue, prehistoric-looking flowers before. Richard’s new desert garden along the driveway is growing in nicely with the aloe plicatilis blooming for the first time. Also the yucca he and his brother dug up inTexas is finally blooming. “I’ve only waited 52 years for it”, he laughs. There are so many stories that come with each and every plant in Richard’s collection. It’s always a walk on the wild side. Maybe our gardens in California should never have looked like a Monet painting filled with layer upon layer of water thirsty perennials and lush green lawns big enough for a soccer match. Because we were first settled by Easterners who could grow these plants with natural rainfall I’m going to give us a pass. It wasn’t our fault. But now we are wiser and smarter. We may have been kicking and screaming at first but all us us now accept that water is limited and we need to use it wisely. That doesn’t mean, however, that we have to live in graveled yards with no landscaping. Our goal should be to figure out what the new California landscape should realistically look like and plant accordingly. We can still be surrounded by green and silver foliage and colorful flowers that look lush without breaking our water budget. Look outside the old box and discover a whole new plant palette and a way of gardening that works for all of us. Recently in the mail, I received a collection of low water use, low maintenance plants native to Australia. I plan to trial the small plugs in my own garden but I know already that they are going to be winners. I have seen a couple of them at the wholesale nurseries. Others are improved selections of known tough, drought tolerant plants. They are well suited to our Mediterranean climate, easy to grow in well drained soils and hardy in winter. I’m looking forward to a time when they are available in local nurseries. In the meantime, I plan to specify them where appropriate in future landscape designs. I”m excited about all 5 varieties of plants I received. Three are grass-like and the other two are compact versions of well known shrubs. You might be familiar with the compact bottlebrush ‘Little John’. Breeders now have come up with a new improved version called Callistemon ’Better John’ because of its vigorous growth and dense blue-gray foliage. This 3 foot tall by 3 feet wide shrub is easy to grow, quick to establish and is long lived in the landscape. Hummingbirds love the 4-6 inch long red flowers during the spring. The other shrub variety I am going to test is Westringia ‘Grey Box’. Westringia are deer resistant and very drought tolerant once established and ‘Wynabbie Gem’ and ‘Morning Light’ have been popular for years for this reason. Grey Box is a new dwarf form with beautiful grayish-green foliage. It doesn’t need pruning to keep it at 3 feet tall and wide. From late winter to summer, white quarter-sized flowers appear in small clusters along the stems. I’m anxious to grow this shrub myself. A couple of the grass-like plant plugs I received are an favorite of mine. I’ve seen lomandra ‘Breeze’ growing in heavy shade and also in sun. Deer don’t like it and it looks great with little water. Now there’s a new cultivar called ‘Baby Breeze’ which stays at a graceful 18 inches tall. If you want the look of a short grass with no maintenance Lomandra is the new go-to plant. It even has yellow-orange tiny flower spikes in late spring. Lomandra ‘Katrinus Deluxe’ is the other selection I’m going to grow out. It’s extremely drought tolerant, very shade tolerant, cold and heat tolerant and deer resistant also. 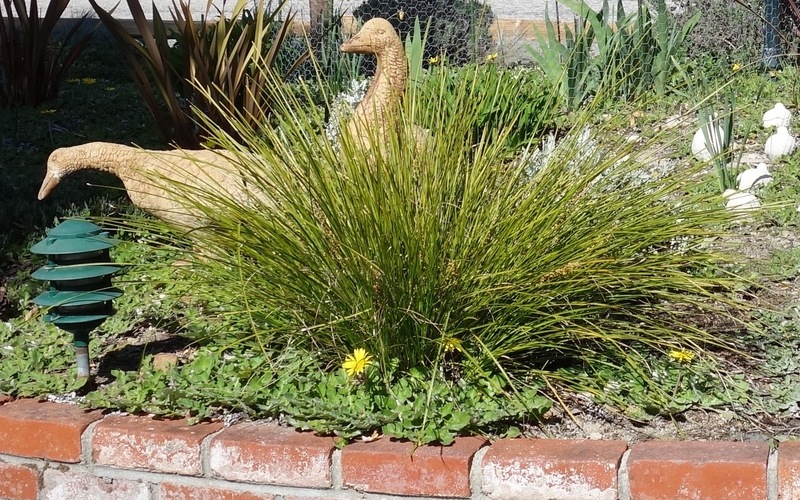 It looks like an ornamental grass but you don’t have to cut it back in winter. It’s evergreen even when temperatures drop into the teens. Dianella ‘Little Rev’ is the last plant I’m looking forward to growing. This flax lily has an weeping architectural habit. It’s a very tough and drought tolerant grass-like plant good for erosion control as well as planting on it’s own or in groups. In spring it blooms with masses of small dark violet flowers. This is a clumping plant for full sun to partial shade that slowly spreads by rhizomes. As with the others this plant also is low maintenance and requires little water once established. I’ll keep you posted as I discover new plants for our changing times and changing gardens.